Expanding an online store to a giant multi-vendor marketplace like eBay, Amazon, Alibaba, Esty, and so on is a wise strategy that anyone runs an online business would go for. There are a bunch of marketplace extensions out there that can make it possible. However, our aim is not just to turn your store into a multi-vendor marketplace, but also to make it convenient, simplify the processes, and ease the work on managing and purchasing for the store owner, sellers, and customers. 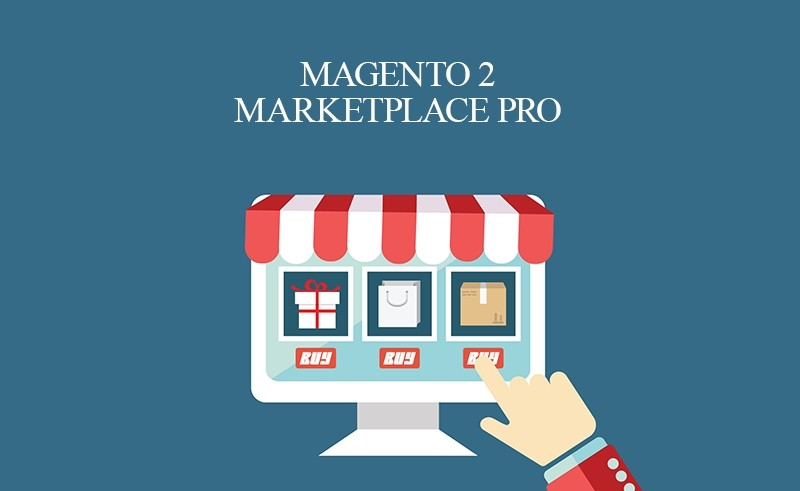 Let’s take a look at the solutions Landofcoder Magento 2 Marketplace Pro brings. 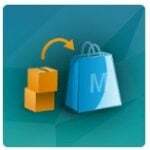 Now, let’s see how Magento 2 Marketplace Pro benefits all parties involved, including Store Owners, Sellers, and Customers, in a more detailed review. By diversifying your store with many sellers and products, you can give your customers more choices of brands and styles. In order to purchase many products from many vendors, they can either go to add those products to a single shopping cart or go to each vendor’s store and check out in separate carts. After logging into Seller Cpanel, sellers will be led to Advanced Report in Dashboard immediately. In this section, sellers can take an overview of their sales report, including total sales, products, and orders by day and by country. Also, they can view order details such as order ID, best seller, and most viewed products. The advanced report shows data in a smart chart for later analysis. Sellers are well supported to present their brand details clearly to their customers when coming to Profile section. They can add Contact number, Shop title, Location, Return Policy, Shipping policy, and so on. Plus, sellers are enabled to upload company banner and logo so that customers can recognize their brand. In particular, social media integration makes it possible for sellers to optimize SEO. They can link their store to their accounts on Twitter, Facebook, Instagram, Google+, Youtube, LinkedIn, Vimeo, and Pinterest. Sellers are allowed to make any changes at any time they want and they will be updated in their frontend store automatically. As for Sales section, sellers can track all details of Orders, Invoice, and Amount Transaction in the table as well as print them out in PDF. Catalog section is the place where sellers can add and manage all products sold on marketplace platform. Simple Product, Virtual Product, and Configurable Product are all supported and sellers can add those types by themselves without waiting for admin permission. Likewise, sellers are able to enable and disable any products anytime they want within a single click. The process of adding a new product is simple and it is super easy to config. Also, there is not much difference among 3 types of products. Sellers will define the newly added products in terms of Attribute Set, Name, SKU, Price, Tax Class, Quantity, Stock Status as well as Contents, Images, SEO, Related Product, Design, Gift Options. Now, let’s take Simple Product as an example. When you add a new single product, the first thing you want to do is add it to a specific Attribute Set to make it searchable in a product category. 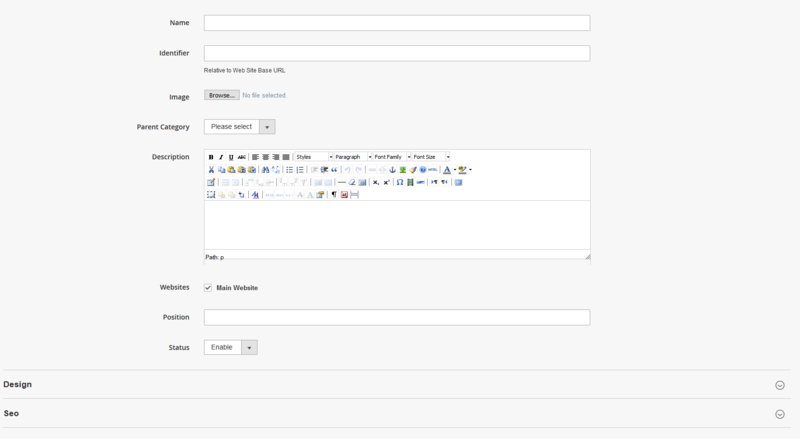 All you have to do is click on the name of the attribute set in the drop-down menu that your product belongs to. Then, you can name the product, enter SKU number and price. In particular, in order to run a special promotion program, you can set up in Advanced Pricing. Calendar gadget makes it easy to schedule a specific date for the program. Also, by applying special price for a lot of products in Tier Price section, you can encourage your customers to purchase more. You are equipped to control which website or customer group is applicable. The best part is Tier Price value can be added as many as you want in a set period of time. 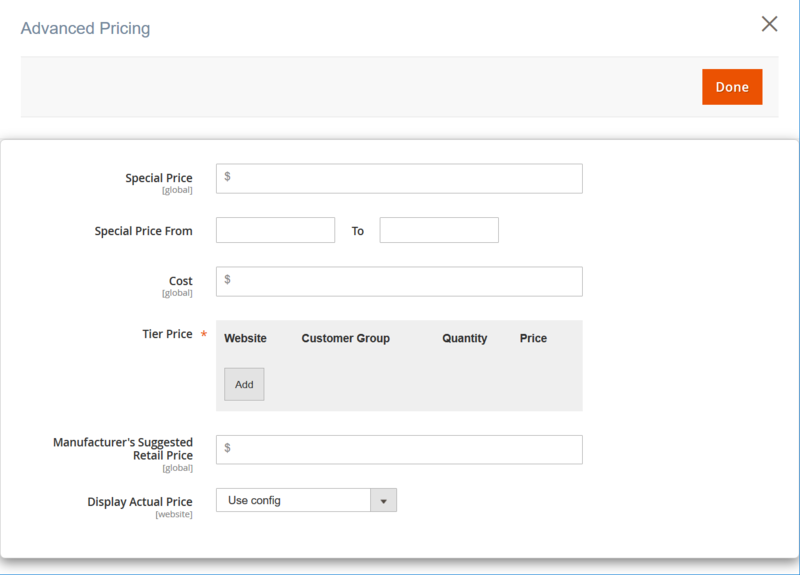 In other words, Tier Price can be applied to many websites as well as many customer groups. Plus, you can delete every single Tier Price with a click. In case your target customers are also retailers, you can enter a value in Manufacturer’s Suggested Retail Price. Next, define if your single product is taxable or not. Then, enter Quantity section. Otherwise, go to Advanced Inventory to customize more details for your new single product. Here, you can either manage and add your own values or use Config Settings. Next step is to set Stock Status, Weight, and Visibility. 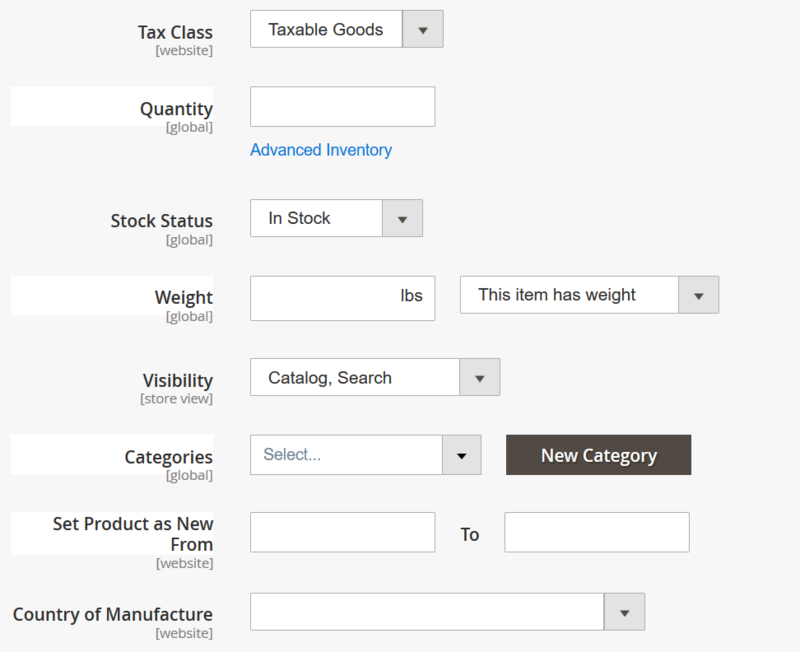 As for Categories setting, you can select from the drop-down menu or add a new category that you single product belongs to. Plus, you are able to set the product as New for a specific period of time to catch your customers’ attention. Then, expand Contents and Image. 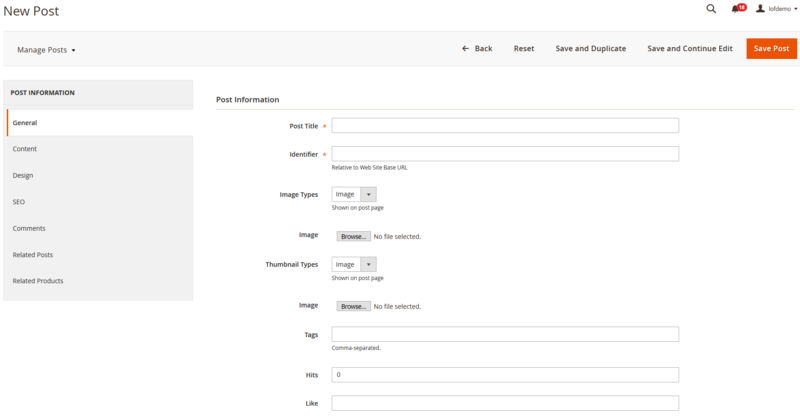 Here, you can add Description, Short Description, and upload product image. Another important section you will want to fill in is Search Engine Optimization (SEO). 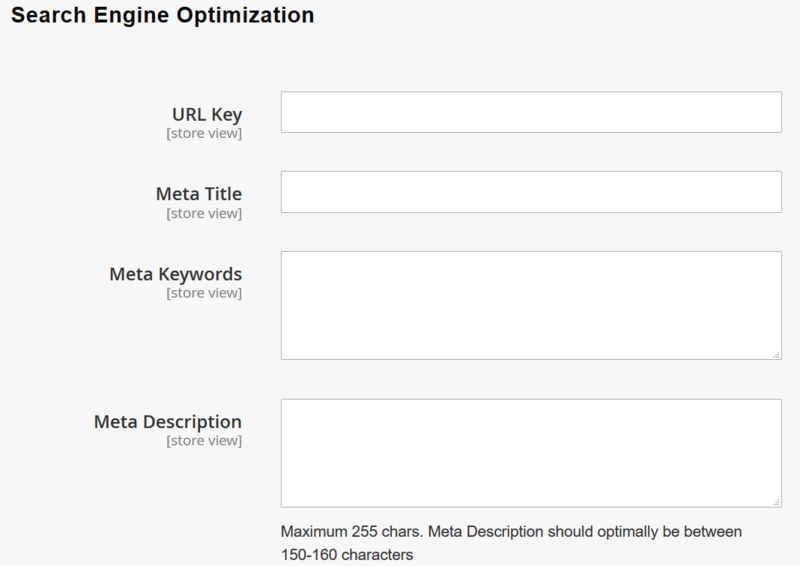 You can add URL, Meta Title, Meta Keywords, and Meta Description for your store to get Google indexed. 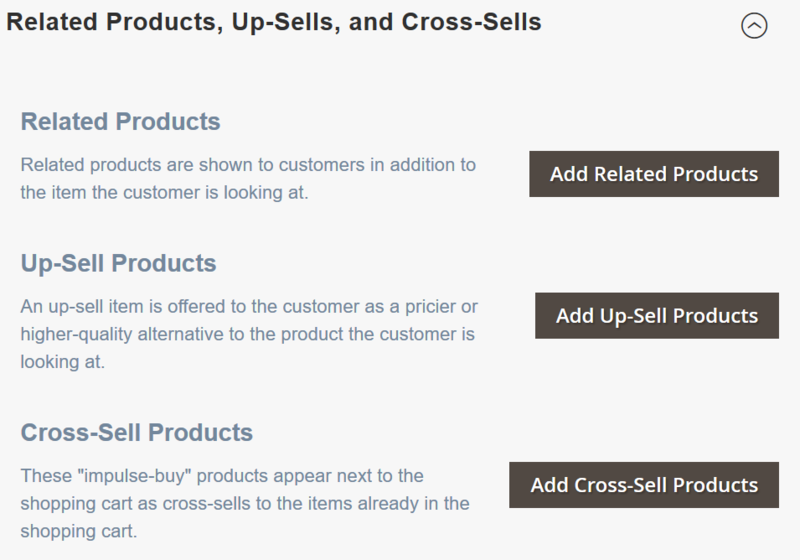 Then, add Related Products, Up-sell Products, and Cross-sell Products. For each kind, you can add one or multiple products. Next, add and define Customizable Options. You can customize how the product is displayed in store view in Design section and even schedule design update in advance. Sellers can reply to messages from their customers as well as check reviews and ratings in their store. Sellers can turn on Vacation status, set dates, and display a custom message to notice their customers. Also, sellers add custom text displayed when any purchase effort is made. For plenty of products, sellers can import/export via CSV file which includes all product types, tier pricing, custom options, and so on. 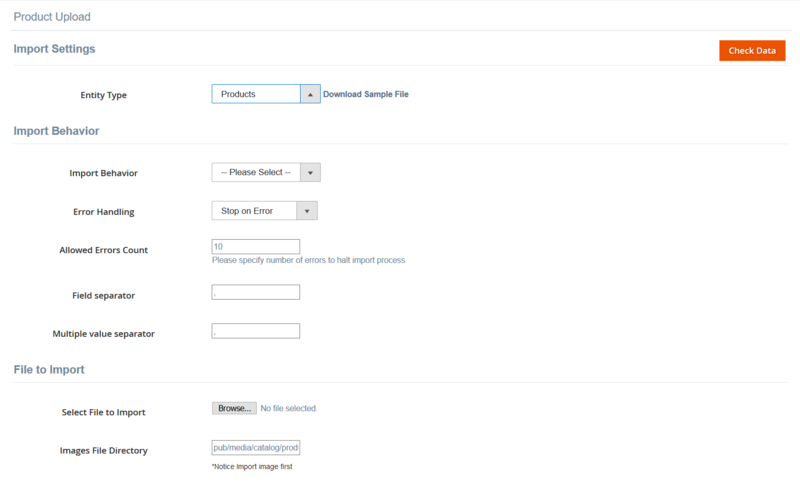 Besides uploading CSV file, sellers will need to customize import behavior to avoid unwanted errors while importing such as Import Behavior, Error Handling, Field Separator, and Multiple Value Separator. Exporting product file is quite simple. 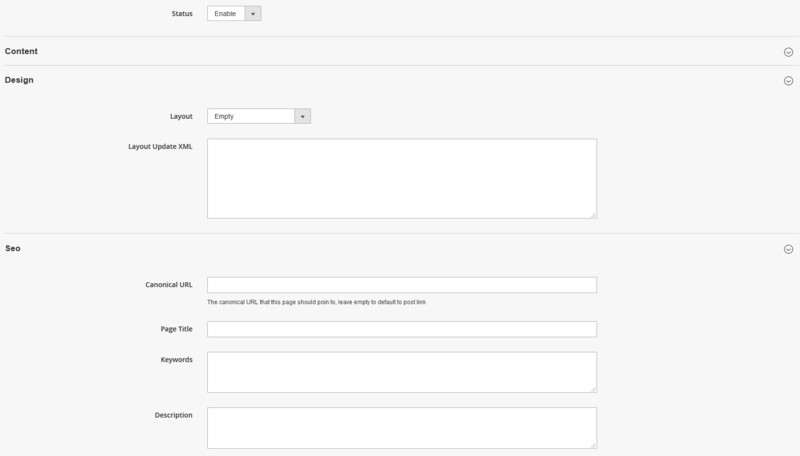 All you have to do is choose Entity Type, Export File Format, and check Fields Enclosure if you want. Sellers can attach their store’s physical location and show it on Google Maps. 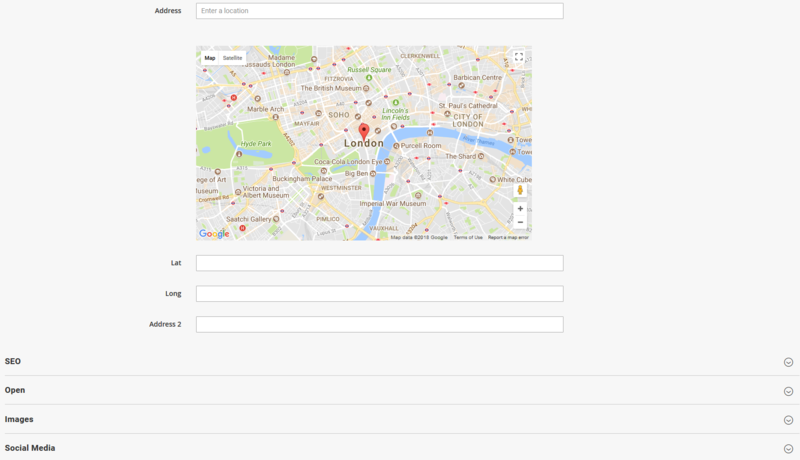 Moreover, they can add more details such as name, link, description, city, Zip code, country, color, icon, open days, image, social media, and so on. In particular, Sellers can optimize page title, meta description, and meta keywords for SEO as well as add tags to make store location more searchable. Sellers are supported with everything they need to create their own SEO-friendly blog as well as enable/disable blog within a single click. 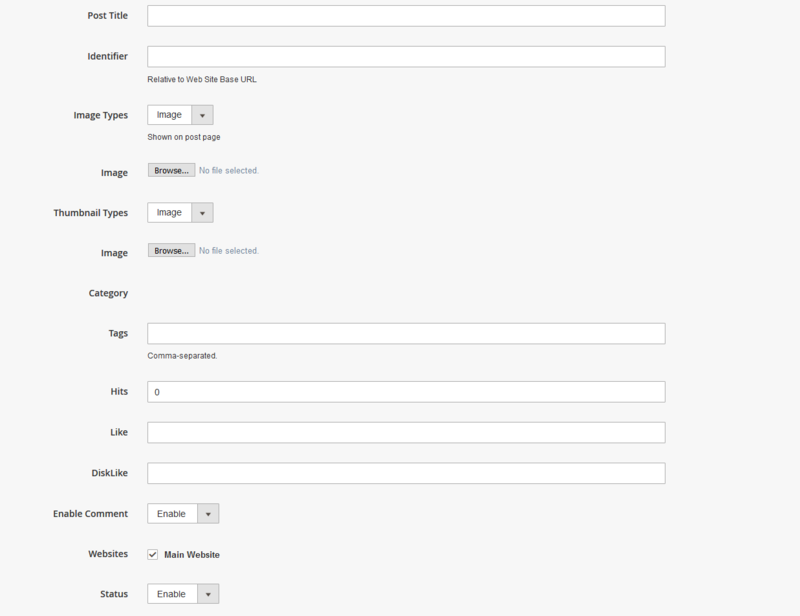 They can set up URLs, add page title, keywords, description, and tags, enable comments. Plus, it’s super easy to upload an image or a link to a video from Youtube and Vimeo to blogs. 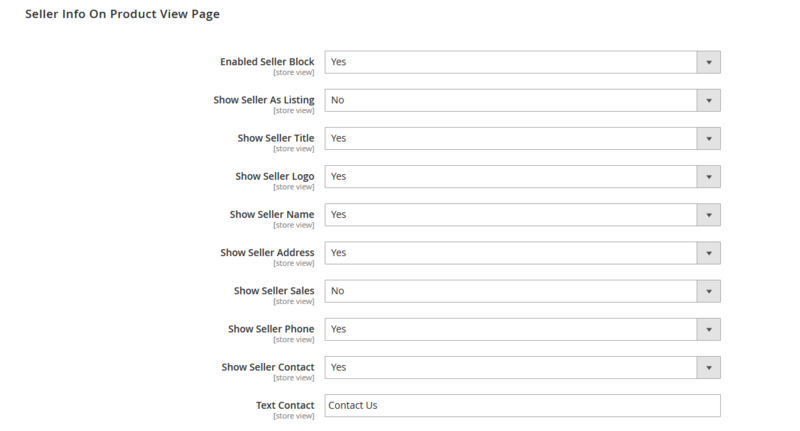 Sellers also have multiple choices of blog post layout such as 1 column, 2 columns with left bar or right bar, and 3 columns. To have an overview of all seller orders in your store, go to Sales -> Manager Seller Orders. You will see all details of orders with ID, Currency, Discount Amount, Grand Total, Seller Amount, Status, and seller name. With a single click on the seller name, you are able to see every detail from that seller’s profile such as general information, social networks, products, design, and meta description. For Order Transaction, you can track transaction status (pending, processing, or complete) for every single item from all sellers in one place. You can see invoices from all sellers and go to details of every single one. Here, you can also edit Billing Address and Shipping Address. In addition, you can add Comment Text in Order Total and decide whether to notify the customer via email and make it visible on Storefront or not. As for Refunds section, ID, Order Number, Status, Refund Number, Order Date, and Seller name are clearly displayed in the table. You can check or uncheck any of those 6 values to make them visible or invisible. To access seller profile, besides reaching seller orders, you can go to Seller -> Manage Seller. Then, click on seller row to get to the detailed page. Plus, this section allows you to create, approve/disapprove, and delete Seller Profile. Categorizing sellers into groups helps your customers find all sellers available for a specific product. 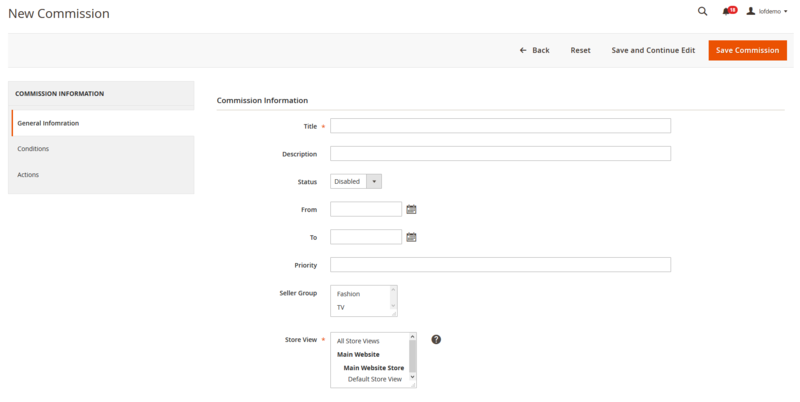 You can add and enable new commission applicable for specific seller groups in a specific period of time. Also, you can make the commission active in default store view or website. From backend, you can track the whole details about sellers’ payment activities, including transaction by amount, seller amount, payment method, withdrawals information, Paypal account, and Paypal Transaction. 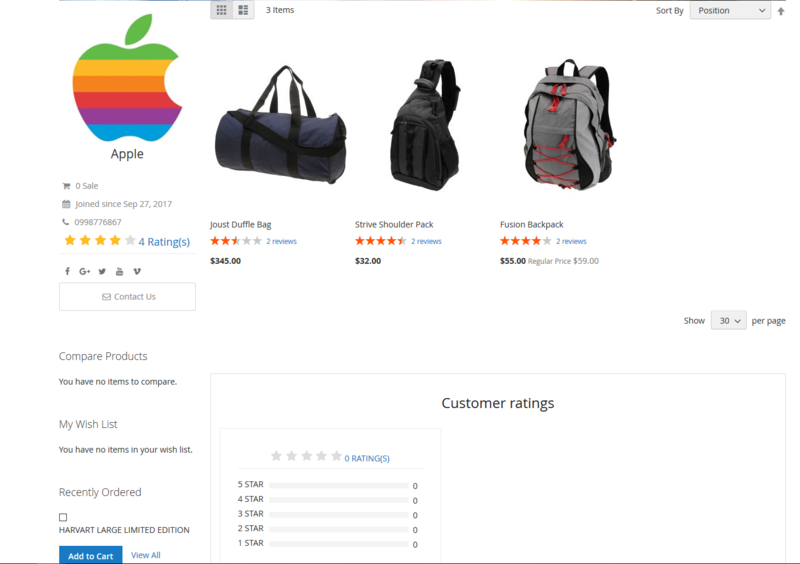 You can see Review & Rating for all products from Store View or the whole website and take action for them. All review & rating details are shown in a table, so you can take a very quick look and decide whether to reject or approve. Also, this action can be applied to either single or multiple review and rating at the same time. As for Blogs, besides creating and managing blogs as sellers do, you can set up Related Posts and Related Products and enable them on Store View or Main Website Store. In Configuration section, you are supported to manage and give authorization to most of the sellers and customers’ activities. General Settings: You can customize Seller List URLs, Seller URL Prefix, Seller URL Suffix for better SEO. You will also decide if Review & Rating need admin approval. 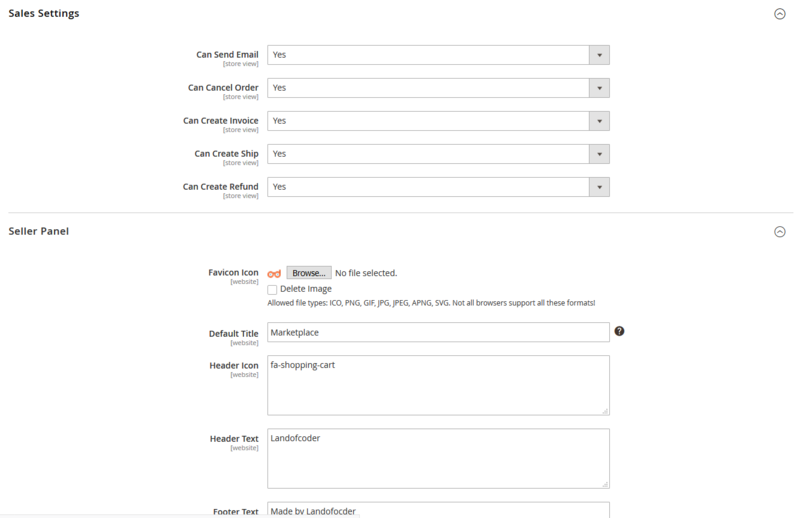 Seller Settings: You can control if any changes made by sellers need admin permission by set Need Admin Approval to Yes. Plus, admin can set either store view commission or global commission. Sales Settings enables you to activate/deactivate Email Sending, Order Canceling, Invoice Creating, Shipping Creating, and Refund Creating. Seller Panel helps you upload Favicon Icon, Default Title, Header Icon, Header Text, and Footer Text of your site. 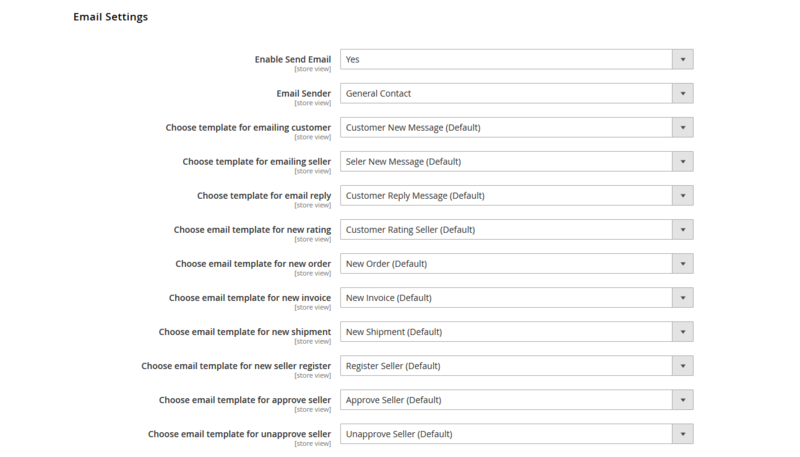 Email Settings allows you to enable emails between customers and sellers as well as choose the templates for each of them. Sellers Infor gives you many options for displaying seller information on product view page. You can show and hide any info you want including Title, Logo, Name, Address, Sales, and so on. 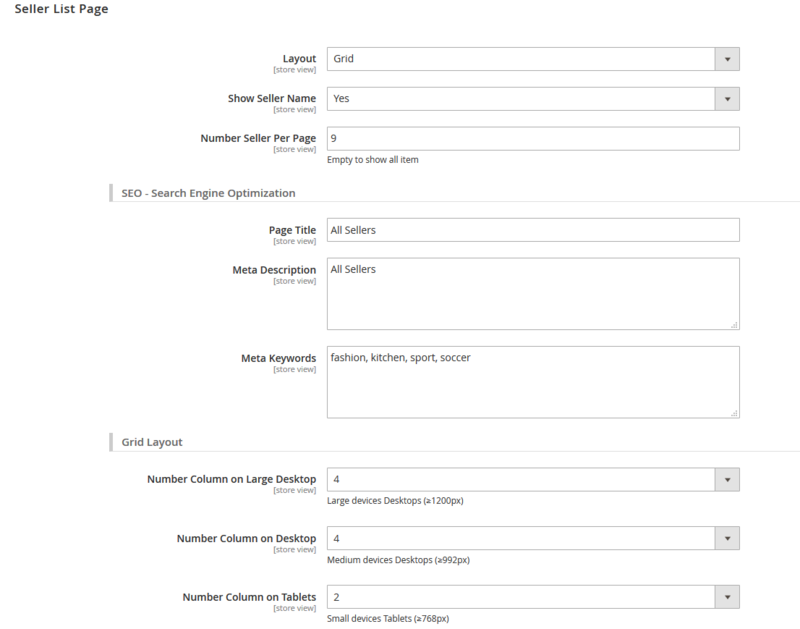 Seller List Page lets you display all sellers in your store in List or Grid Layout. In particular, you can customize to optimize SEO and responsiveness in mobile devices.